Please join faculty, staff, students, and the Board of Trustees for the celebration of the groundbreaking of the new Bates STEM building in honor of the donors, Michael Bonney '80 and Alison Grott Bonney '80, P'09, P'12, P'15, whose generous support make this transformative building possible. 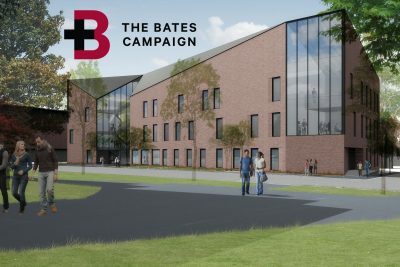 Please join faculty, staff, students, and the Board of Trustees in celebration of the groundbreaking for the new Bates STEM building and to honor the donors, Michael Bonney ’80 and Alison Grott Bonney ’80, P’09, P’12, P’15, whose generous support make this building possible. RSVP by Thursday, April 25. Please contact us with any questions at rsvp@bates.edu.